With summer produce at it peak sweetness, why buy supermarket pops when you can make your own? It is as easy as pureeing fruit, balancing it with sugar and a little citrus, and freezing it in a mold. This recipe comes from the June 2011 issue of Bon Appetit. The recipe that we chose first to try was the Pineapple Paletas… Mexican-style pops that are loaded with pieces of fresh fruit. Luckily, I had some old Tupperware molds for pops. 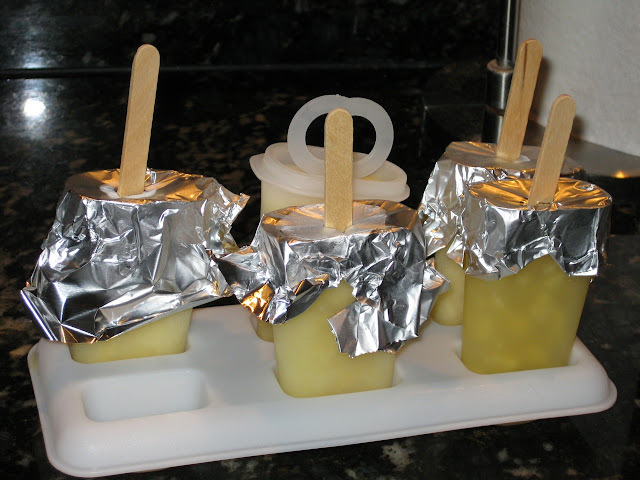 I could only find one of the plastic tops, so I just covered the other molds with aluminum foil then poked the popsicle stick through the foil and placed them in the freezer. 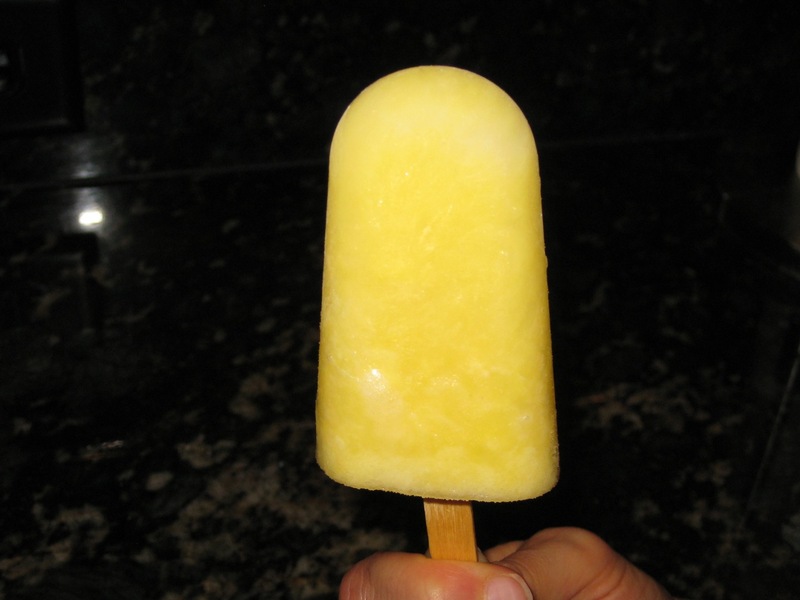 A few hours later, we had delicious pineapple pops. When my peaches are ripe, we are trying the Peach-Vanilla Cream Pops! Enjoy! 1. Bring sugar and 1 cup water to boil in a small saucepan over high heat, stirring until sugar dissolves. Chill syrup until cold, about 1 hour. 2. Puree syrup and 2 cups pineapple in a food processor until smooth. Set a fine-mesh strainer over a medium pitcher; strain, pressing on solids to extract puree. Stir in lime juice and remaining 2 cups pineapple. Divide among molds. Cover; insert ice-pop sticks. Freeze until firm. Dip bottoms of molds into hot water for 20-30 seconds to loosen pops. Remove pops and serve. One Response to "Pineapple Paletas"